Through countless efforts across Egypt, the Coptic Catholic Church — although numerically small — works tirelessly to elevate lives and promote the flourishing of communities. The challenges are great, particularly when serving those who are marginalized. But some of the success stories offer inspiration and, in so many ways, signs of hope. Video produced by Roger Anis for CNEWA. 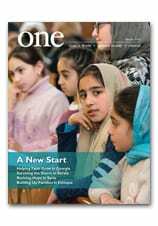 Learn more about the remarkable work underway in Egypt in Signs of Hope in the December 2018 edition of ONE. In addition to running the local chapter of Caritas, the Rev. Vasyl Ivanyuk has his hands full, shepherding six parishes and serving as a chaplain to those serving in the nearby front. Only when asked does he point out the church’s shattered yellow and white stained glass windows as scars of war. “Three are from mortar shrapnel, one is from a rocket that came through here in July 2014,” Father Ivanyuk says. It was during this time that he saw an influx of seniors seeking help at the house of worship. Some 600 displaced families sought refuge here through March 2015 at the height of the war, just as the second of two truces was being brokered in the Belarusian capital of Minsk. The agreements have never quite taken hold. “Half of the displaced we helped were elderly. We served 60 families a day, handing out 10 days’ worth of food [to each]. Altogether, we have distributed 300 tons of clothes and 17,000 food boxes since 2014,” Father Ivanyuk says. Seniors are always the least demanding, he observed. They never ask for more, and are the most gracious. He recounted the story of one couple. Both were 82 years old; both had walked a tortuous 24 miles in frigid February weather at the height of the war in 2015 to find safety. Units from the Ukrainian army picked them up on the government-controlled side and drove the pair to Father Ivanyuk, who arranged for their care. On the day of the priest’s 25th wedding anniversary, the elderly man gave Father Ivanyuk a bouquet of flowers for his wife. Although the human spirit is undoubtedly strong, pensioners can find it difficult to adapt to new circumstances, the priest notes. “A mature tree can’t be easily transplanted,” he says of those who find themselves uprooted suddenly. India’s Andhra Pradesh state has passed a resolution which church leaders say will help socially poor Dalit Christians receive welfare benefits enjoyed by their counterparts in Hinduism. The legislative house of the southern state passed the resolution on 7 February appealing to the federal government to make amendments to regulations to allow Christians from Dalit communities to enjoy benefits meant for the advancement of socially disadvantaged people. The resolution proposed by chief minister Nara Chandrababu Naidu said that if Dalit people convert to Christianity it does not change their social and economic status. “We appreciate the move. Naidu understood the plight of the poor Christians but that does not mean we achieved our target. There is still long way to go,” the Rev. Devasagaya Raj, secretary of the Indian bishops’ office for Dalits, told ucanews.com. The Andhra Pradesh Federation of Churches (APFC), an ecumenical organization of heads of different churches, welcomed the resolution on behalf of the Christian community. The APFC said it appreciated Naidu’s “consistent stand on this issue” that Dalit Christians should be treated on a par with Dalits who had adopted Sikhism and Buddhism. The Christians’ struggle began in 1950 when a presidential order said only Dalit people following Hinduism could enjoy constitution-guaranteed concessions and seat reservations meant for the socioeconomic advancement of Dalit people. The order effectively cut off benefits to Dalit people who converted to other religions. It was amended twice to include Dalits among Sikhs in 1956 and Buddhists in 1990. Christians of Dalit origin are estimated to be make up 33 percent of India’s 28 million Christians. Ephpheta was founded at the Pope’s request after his visit to the Holy Land in 1964. Supported almost entirely by CNEWA, Ephpheta admits children on the basis of need, not their parents’ ability to pay. Ephpheta is run by the Sisters of Saint Dorothy, a largely Italian community dedicated to spreading the love of Christ through fostering human and Christian development. Although engaged in many types of educational and social work, the sisters have specialized in educating the deaf. Currently, there are 182 students attending classes at Ephpheta Institute; at the beginning of the school year, the number of students fluctuated (more or less) according to various reasons: new students enrolled at the school while some students due to several factors such as difficult access issues; expensive transportation costs which parents cannot afford; change of residence; and other personal reasons/ decisions taken by parents. Currently, there are 14 or 15 students enrolled in the kindergarten and preschool; in the upper classes, the attendance tends to decrease. Teacher training and activities (divided by class), were drawn up in accordance with the new academic programs offered by the Palestinian Ministry of Education. The common goal agreed upon, is to deepen the value of respect and cooperation towards oneself and others. This value involves teachers and students and will be implemented within the year through various initiatives and activities. During the past four months, several initiatives have been implemented to help develop the skills of the students and help them overcome, at least in part, the “barrier” which may affect them psychologically, and their ability to communicate. The initiative included various activities such as Arabic dance, art, music, cooking and student-to-student exchange with semester. Students also had the opportunity to get creative, participating in a course by “CheArte” an organization dedicated to children’s expression through art. During the course, both students and teachers learned how to express their emotions using art forms and color. They learned how emotions can deeply affect us and by using art, to express their inner feelings, helping them to improve their wellbeing. The teachers also participated in a workshop and ‘formation courses’ in cooperation with the Ministry of Education which taught them how to present the new revised curriculum to students. Ephpheta Institute also continued to offer parents workshops that raised awareness and enhance understanding of the needs of deaf children and how to be an effective, supportive parent. Finally, all operators, teachers, speech therapists, specialists, continue to demonstrate commitment in carrying out their role with the aim to accompany and help students towards a positive assimilation into Palestinian society. Cardinal Peter Turkson is in India to mark the 27th World Day of the Sick.